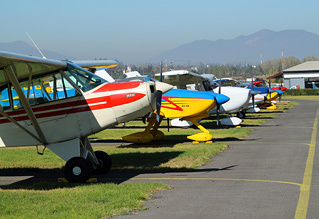 The Air Club of Santiago was founded in 1928, under the name of "Club Aéreo de Chile" (Chilean Air Club), at the military aviation facilities at El Bosque Air Base. Today it is located in Tobalaba Airfield. Hundreds, if not thousands, of civil pilots were trained in the intervening years. 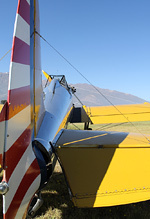 Antonio Segovia Rentería was at Tobalaba and sends us his account of a day of celebration at the airfield. On Sunday 5th of May the anniversary celebration of Club Aéreo de Santiago was held. It was a very sunny day, with clear skies giving the perfect landscape for the ceremony. 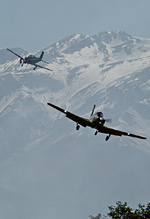 At 11:00 local time the Civil Aerial Authorities and the Chilean Air Force started festivities on the ground. Meanwhile five Piper PA-38 Tomahawk IIs and two new Diamond DA-20s were taxiing to the northern end of the runway. Unusually, the crews stopped the engines and got out of their airplanes for the final part of the speech. A few minutes after that, the pilots returned to their airplanes and departed. 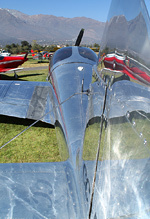 The first wave was three Piper Tomahawk II, followed by the remaining two, and finally the DA-20s. 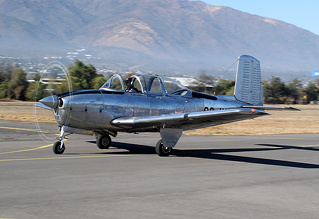 he departures continued with a formation of three Beechcraft T-34 Mentors, led by the yellow aircraft, CC-PNV, followed by a section of two bare metal Mentors from the Air Club. All of the Mentors are ex-Chilean Air Force airframes. 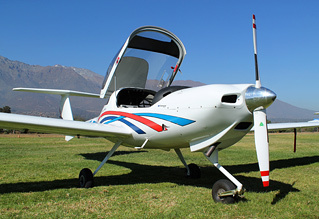 The last airplanes to take off were the Escuadrilla de Aviones Clásicos (Classic Airplane Squadron), composed of a Cessna 180, Aeronca 7EC, Piper PA-18, Cessna 140, Ryan ST-3KR, Piper J3C, Aeronca 7AC and the oldest airworthy airframe in Chile, a Luscombe 8A built in 1939. The flying display started with a delta formation of the five Piper Tomahawk IIs, followed by a flypast from the DA-20s from the north to south. The three T-34 Mentors, approaching from the south-east, flew over the main tribune and made a 360 turn to get in front of the control tower and passed over the crowd again. 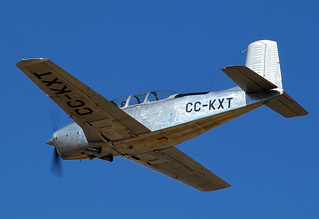 Then the Piper Tomahawk IIs (now in echelon formation) arrived from the north and performed a left turn for landing, followed by the DA-20s, with all of the airplanes landing individually. 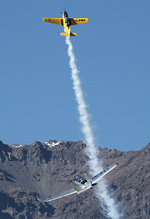 A few minutes later, from the west, the three Mentors flew over the control tower with the lead aircraft using white smoke, then the airplanes performed a break and the leader performed an Imelmann. Meanwhile, the Piper Tomahawk IIs taxied in together and turned in front of the crowd. From the north, the three T-34 performed a left break and landed. 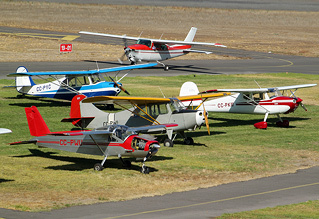 Afterwards, the classic airplanes arrived from the north in "mouse tail" (line-astern) formation, making a very low pass over the taxiway, beginning with Cessna 180 flying fast and low, then one of the classic Aeronca 7EC (in Chile this airplane was the answer for air clubs without much money), followed by the Piper PA-18, a very low pass from the Cessna 140, the rather loud Ryan ST-3KR, and finally the Piper J3, Aeronca 7AC and Luscombe 8A with the Cessna 180 making a second pass to close the flypast. The airplanes landed in the same order of their appearance and parked together for the static show. 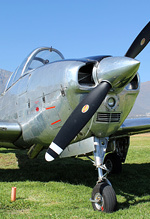 Also in the static display were other airworthy airframes, including the Bo-208, Piper J3, Cessna 185, Piper PA-22 Tripacer, Cessna 170, Cessna 140, GC-1 SuperSwift, ENAER Falco 8, Cessna 140, Husky A-1, Piper PA-18, Cessna 180 and Beechcraft 35 Bonanza. 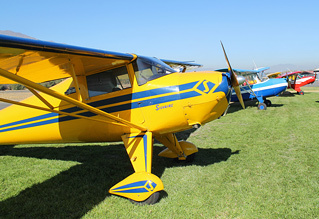 In the other part of the exhibition were part of the actual fleet of the Air Club, composed of Piper PA-38 Tomahawk II, Piper PA-28, Piper Arrow IV, Cessna 172, Piper PA-34 Seneca, American Champion 8KCAB, Vans RV-9A, Piper PA-18 and the brand new DA-20C1 Eclipse. 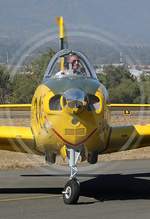 The event was a very interesting celebration with a lot of the classic airplanes in Chile flying in a wonderful way. Many thanks for the hospitality of the people in the Air Club of Santiago.